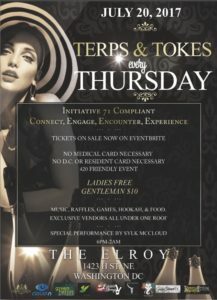 We’re re excited to bring you Terps & Tokes at the Elroy every Thursday in Washington DC. Terps & Tokes is where people come to connect, experience, create, and vibe. We aim to bring you unparalleled experiences. This is a 420 friendly event. Each guest is automatically entered into a raffle. We have decided to do a special this week! $10 tickets this week online an at the door before 8pm. Ladies are free with flyer! Our events will have live pressings, dab bars flower bars, hookah bar, vapes, music, funny dip, jewelry, food, edibles, cbd, games, raffles, salves, cash bar, apparel, cannabis potcorn, different flavors of infused cannabis snow cones, cannabis chocolate fondue and toke accessories. Book one of our cannabis friendly bartenders today! INQUIRE ABOUT THE PARTY BUSES, LIMOS, OR CUSTOM REQUESTS! WE CAN GET JUST ABOUT ANYTHING! What are my transportation/parking /lodging options for getting to and from the event? Your transportation options are metro, vehicle, Uber, trolly, Lyft or taxi. There is street and paid meter parking. Lodging can consist of hotels, apartments, condos or houses on homeaway.com, airbnb, etc. There are plenty of budget friendly and upscale accommodations in the area. No. You can take a snapshot or save it to passport and present it upon arrival. BYOB but you won’t need too!!!! !